When Leon Goretzka picked up the ball just yards inside the Hertha Berlin half, only one thing crossed the 22-year-old midfielder's mind. 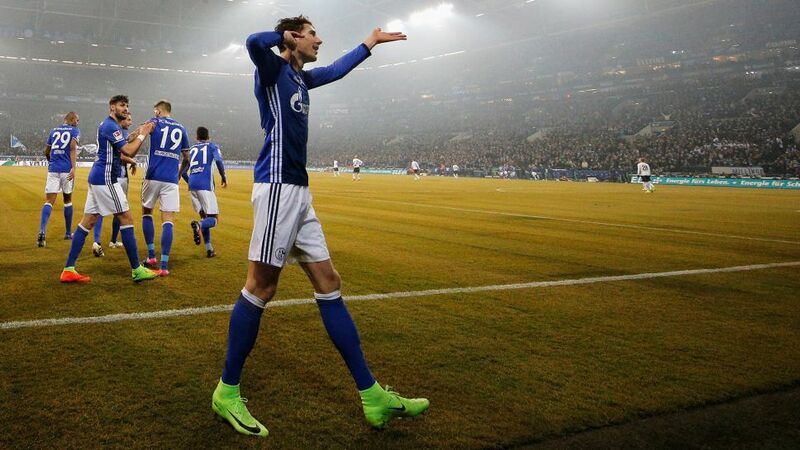 FC Schalke 04 were already 1-0 up – thanks in no small way to Goretzka's commitment and determination in the heart of their midfield – and he wanted to make a more tangible contribution to the Royal Blues taking all three points. Five seconds or so later, he had succeeded. Check your Official Fantasy Bundesliga scores here! After the match, Goretzka provided his assessment of a win which lifted Schalke onto the cusp of the top ten. Leon Goretzka: I was given a dart board for my birthday a few days ago and I've been spending quite a bit of time in the dressing room recently playing with it (smiles). One or two of the lads were starting to get concerned that I might put my football career on the backburner because of it so I told them that I was just working on perfecting my precision. So it just felt right to get a goal against Hertha and then pretend I was throwing darts as a little joke for the lads. Question: So you're playing darts in the dressing room now? Who's the best? Goretzka: (smiles) Me, of course! We've got a few players who enjoy it, like [Klaas-Jan] Huntelaar, Burgstaller or [Alessandro] Schöpf. Considering we're only hobby darts players, we do pretty well at it. Goretzka: A few cups were flying in the dressing room at half-time because I was really annoyed. When you don't reap the rewards for a good performance then it just gets your back up, but the lads had comforting, encouraging words for me at half-time and that gave me heart and belief that it would work out at the third attempt. Three is the magic number, as they say, and I'm delighted that I was actually able to pay back their faith in me by scoring. Question: It really looked like Schalke were a team out there – how did you see it? Goretzka: We were a working unit, and what's important for us to note is that we were able to keep things going for the full 90 minutes and control the game with our possession. You could already see in our game in Munich that we were improved on our previous games, and we did our job very well once again here. Our positional game was good and that enabled us to find room and create chances against a team who have certainly one of the best defensive organisations in the league, and this time what made the difference was how we put our very last drop into it. It was a very good game from us overall and we can be pretty pleased with it.